Evelyn reminds me of just how much a theorist I really am. Go, read, enjoy, but do please save a little sympathy for the fellow back here choking on chalk dust. Neil Gaiman is considering switching from Vista to Ubuntu. . . and when he visits MIT in May, I’m sure there will be plenty of people willing to help. If you’re too lazy to click and embiggen, the second item is S. Rao et al., “Topic 1: Attracting Girls Into Physics” AIP Conf. Proc. 628, 9 (2002). The third item is Chris Walter’s “Why understanding neutrino interactions is important for oscillation physics” (on the arXiv here). I worked in Chris Walter’s research group a couple summers ago; he’s a cool guy. This is the sort of thing which tends to get taken off the Network once the Powers Which Be notice that it exists, so we should enjoy it now. Here and there, in chunks of different sizes, we can find James Burke’s original Connections (1978) TV series. Embedded on this page is the tenth and last episode, “Yesterday, Tomorrow and You.” I could say many things about it, but for now, I’ll just note that “network robustness” has become a subject of quantitative investigation, that I can’t escape the feeling the arguments which perennially perturb the science-blogging orbit still aren’t addressing the points which Burke raised thirty years ago, and that you can’t go wrong with Ominous Latin Chanting. Thanks due to Reginald Selkirk. The cat in the picture is δ Carina. The gospel of the Ceiling Cat is written in the LOLCat Bible. The basic Quantum Sleeper unit consists of an aluminum bed frame and headboard with polycarbonate, bullet proof plating that is designed to provide a protective barrier (shielding) between a perpetrator or environmental condition and the homeowners or occupants. You also get a “bio-chemical filter in case of bio-chemical attack” and a rebreather system for doing without outside air. Ben Allen is now on the arXivotubes, with a category-theoretic arithmetic of information. The concept of information has found application across the sciences. However, the conventional measures of information are not appropriate for all situations, and a more general mathematical concept is needed. In this work we give axioms that characterize the arithmetic of information, i.e. the way that pieces of information combine with each other. These axioms allow for a general notion of information functions, which quantify the information transmitted by a communication system. In our formalism, communication systems are represented as category-theoretic morphisms between information sources and destinations. Our framework encompasses discrete, continuous, and quantum information measures, as well as familiar mathematical functions that are not usually associated with information. We discuss these examples and prove basic results on the general behavior of information. It looks like a discussion about this is starting over at the n-Category Café. If I didn’t have to spend today cutting down a 12-page paper to eight pages for an overpriced book of conference proceedings which nobody will read, I’d totally be writing more about it! Thomas Levenson contributes to the information overload by writing a thoughtful post about, er, information overload, and in so doing, he links to Gene Weingarten’s description of the day he buried himself in the “pundustry.” For the sake of the WaPo readers, Weingarten spent Valentine’s Day surrounded by six television sets, two radios and a laptop tuned into the political commentary streaming down through the æther. I can’t shake one particular impression which Weingarten’s stunt left me: Spider Jerusalem did the same thing, pretty much, in volume 2 of Transmetropolitan — but when Spider watched TV all day, lies were exposed, pundits’ careers were destroyed, and a cooking-show host tried to kill herself by leaping from the roof of a building. This is fun. According to the Nielsen “BuzzMetrics BlogPulse” website (by Poseidon’s beard, they come up with goofy names these days! 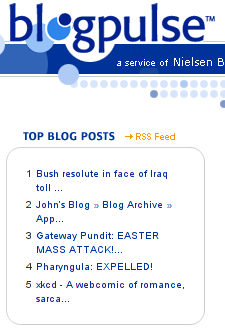 ), the blog post in which PZ Myers told how he had been expelled from seeing the movie Expelled is now the fourth most popular on the entire Network. Thanks to Paul Sims for spotting this. In some parallel world, all publicity is good publicity, no matter how popular you already were or what your intended audience is. However, in that world, Nixon has been beatified, and Osama bin Laden is President of Earth. This is only one of many ways to prove the Pythagorean Theorem. Another was discovered by James Garfield in 1876, a few years before he became President of the United States. A while back, Paul Gowder suggested we scientists get our act together and make our own movie, for general consumption, countering the damnable and insipid lies of Ben Stein’s Expelled. Shortly thereafter, PZ Myers noted that, while he was sympathetic to the idea, it would be foolish to neglect the practical experience of filmmakers in doing so: the people who write the screenplay have to know how movies work. Today, a variant of this proposal occurred to me. Somebody else may well have thought of it first, but I haven’t noticed the suggestion being made. Instead of explaining what evolution is all about, why not make a movie which explains why the Holocaust happened? To be sure, one historian will argue with another about which factors were most important in causing a sustained programme of cruelty to arise when and where it did, but a good documentary could lay all those factors out and, in so doing, make the point that Darwin and Wallace are not heading up the list. Discuss: what could be done that hasn’t been done before? What are the up-sides, down-sides and middle-sides of this idea? John Armstrong raises an interesting question: what books could you give to, say, a bright high-school student seeking an introduction to mathematics? The same question could be asked for physics too, and I’m certainly not above writing a derivative blog post — not to go off on a tangent or anything, but it’s really an integral part of my style. I’m looking for something a little more focused than John Baez’s list of math and physics books, which covers everything up to general relativity, quantum field theory and string theory. Rather than trying to map out a whole self-study version of an undergraduate degree, I’d like to know what materials might be useful for the student who has enrolled in or just recently survived AP Physics. Suggestions? Also, for anybody who missed it the first time, my earlier poll, “what’s broken with science blogging?” is still open. Here’s to another year of missing the important stuff.